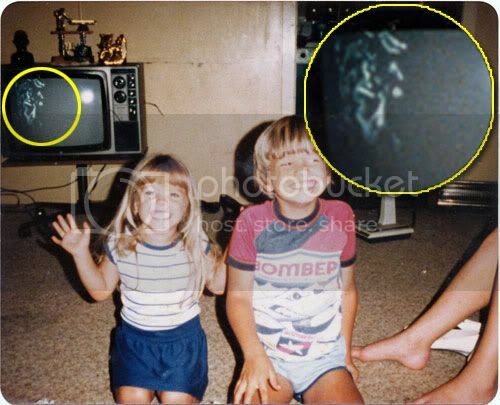 The video below is being touted as showing the ghost of Michael Jackson showing up during a taping of a CNN special with Larry King Live. A man named Derek Burden was just taking a photograph of London, England. No big deal, until after he took his camera home and began uploading them to his computer. He was shocked to see four UFOs that he had not seen when he took the photograph. Another About.com/Paranormal reader named Reg Trevithick submitted this photo of his niece and nephew showing off their new ‘candy’ teeth he’d gotten for them. Reg says the television was turned off and you can see the glow of the red standby light to prove it. However, you can easily see a strange creature in the TV. Reg says police at one time in the past had arrived at the house to capture an Aboriginal man. Rather than be taken alive, the man shot himself to death. Crop circle experts believe the latest pattern to be discovered, a phoenix rising from the flames in Wiltshire, may be a warning about the end of the world. The 400-foot design was discovered in a barley field in Yatesbury near Devizes and depicts the mythical phoenix reborn as it rises from the ashes. Investigators say more formations are referencing the possibility of a cataclysmic event occurring on December 21, 2012, which coincides with the end of the ancient Mayan calendar. The Mayans believed civilisation exists within a series of earth cycles of 144,000 days each with the 13th expiring in December 2012, resulting in Armageddon. Crop circle enthusiast Karen Alexander, from Gosport, Hants said: "The phoenix is a mythical creature, which symbolizes rebirth and a new era in many cultures across the world. 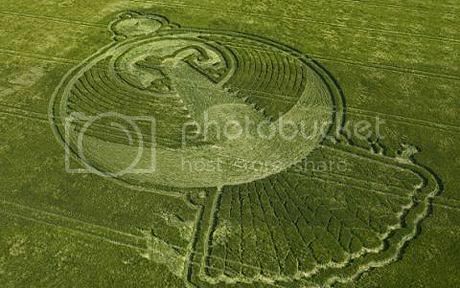 Within the crop circle community many believe the designs are constantly referring to December 21 and its aftermath. This could be interpreted as the human race or earth rising again after a monumental event. The patterns are becoming more intricate with every find and it is exciting to think how they are going to evolve by the time we get to 2012." Recent crop circles have included giant jelly-fish and one image discovered in Wiltshire in June which experts dubbed the most 'mind boggling' they had ever come across. The formation, measuring 150 feet in diameter, is apparently a coded image representing the first 10 digits, 3.141592654, of pi. The Internet is buzzing with reports that countless people in Australia claim aliens abducted them and took them to some kind of medical facility over the Blue Mountains. UFOlogist Michael Cohen says that he believes people making these reports are telling the truth. He says many of them include similar details in their stories, and few of them had had any interest in UFOs before their abduction experience. They are just ‘regular people,’ he said. It may not be clear what's causing the sudden interest in aliens by Australians, but Cohen has a few words of advice. "The UFO phenomenon is real. The E.T. extraterrestrial presence is real." To find all my books at the best prices, please go Here! Join My Ghost & Hauntings Group! 20 UFOs Buzz City in Britain. Be sure to catch the next issue of this newsletter, because I’ve lined up a story about a family pet who returns from the other side. See you then!